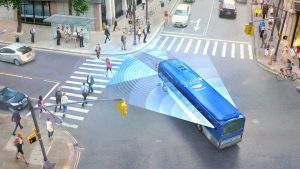 JERUSALEM and MADRID, Jan. 5, 2018 – Mobileye, an Intel Company, a global leader in the development of vision and data analysis for advanced driver assistance systems (ADAS) and autonomous driving, and Spain’s Directorate General of Traffic (DGT) today announced they have agreed to a collaboration intended to reduce road accidents and prepare Spain’s infrastructure ecosystem and regulatory policy for the driving of autonomous vehicles. As part of the agreement, Mobileye and the DGT will promote the benefits of the adoption of ADAS for municipal and private fleets to support improved road safety across Spain. The collaboration to promote adoption will include joint research to determine the magnitude of safety improvement driven by the performance and accuracy of Mobileye 8 Connect™. Furthering the Vision Zero objective, the DGT will also promote the development and adoption of autonomous driving. The DGT is working toward the regulation of autonomous vehicles and will lead the required cross-industry alliances to position Spain as an integrated Autonomous Ready™ country. In addition to assisting to prevent accidents by providing drivers with real-time visual and audio alerts, Mobileye 8 Connect™ collects actionable and dynamic data on city streets, such as infrastructure deficiencies, accident hotspots, parking usage, environment conditions and other road hazards. Data collected will be analyzed by the DGT and other government authorities to prepare Spanish roads for semi- and fully autonomous vehicles, while also contributing to and enhancing the development of Mobileye RoadBook™, powered by the crowdsourced REM Road Experience Management™ mapping technology. Additionally, data obtained will be utilized in other research and development projects to explore new ways to improve road safety. Mobileye and Spain’s DGT will also collaborate on defining the regulatory roadmap required for an autonomous future. Together they will seek to develop a policy framework for efficiently validating the safety of an autonomous vehicle, incorporating Mobileye’s Responsibility Sensitive Safety (RSS) model, which provides specific and measurable parameters to ensure that a self-driving vehicle operates in a responsible manner and does not cause accidents for which it can be blamed. “This collaboration allows us to better understand and place Spain in a leading position for the major changes and opportunities that we are facing in road safety and mobility,” said Jaime Moreno, deputy director for Mobility Management, Directorate-General of Traffic. The landmark collaboration is the latest example of Spain’s efforts to become a world leader in road safety through technological innovation, and builds on Mobileye’s growing presence in the country. As part of Mobileye’s goal of developing autonomous vehicle technology that can be deployed anywhere, the company plans to test and train Level 4 SAE vehicles in varying locations around the world, including Spain.